If you are a Gmail user and always worried about your Gmail account, Is your Gmail Account Hacked or not. All of us are using Gmail Account these days and your Gmail account can contain a lot of personal information, from bank alerts to other important information. So you don,t want to share all these information with others. And most of the time you worried about hacking of your Gmail Account. But with this simple way you can check your Gmail Account is Hacked or not. Google Gmail has a new feature which helps you know about the activity of your Gmail account, From that you know when and from which IP you are using your Gmail Account. 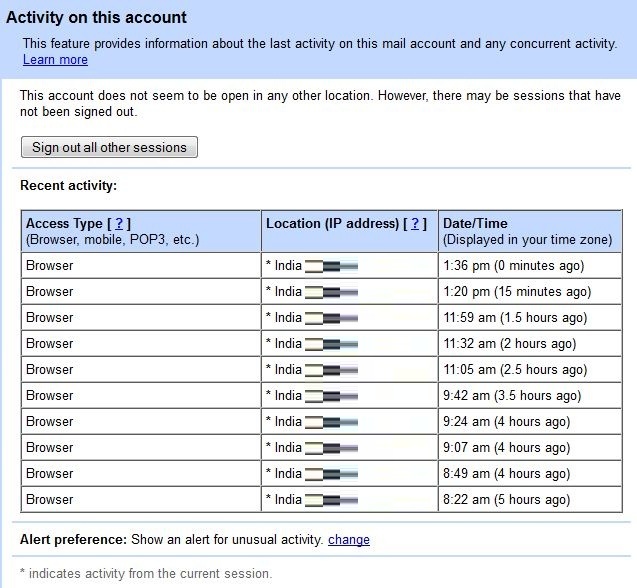 This will helps you to track the Activity of your Gmail Account. And help you to know your Gmail Account is hacked or not or someone is accessing your account. Now Click The Details and New Window Will Open. Which will give you all the details about your Login time and IP from which you login. With this information, you can check your Gmail Account Activity, and Know that your Gmail Account Hacked or not by tracking the Login Time, Browser Type and IP Address. Here are the some good articles which helps you to how to secure your Gmail Account and what to do when your account is hacked. How to Secure your Gmail Account.